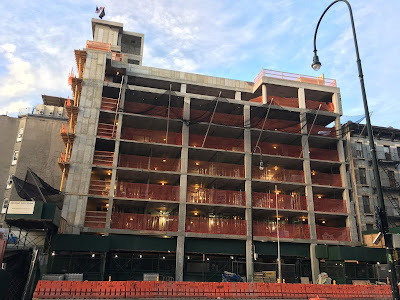 Workers have apparently reached the top at 432 E. 14th St., planting the flag at the retail-residential building at the site of the former Peter Stuyvesant Post Office between Avenue A and First Avenue. To recap, the entrance to the nearly 23,000-square-foot Trader Joe's will be on the 14th Street side of the building while residents will access their rentals from the 13th Street side. 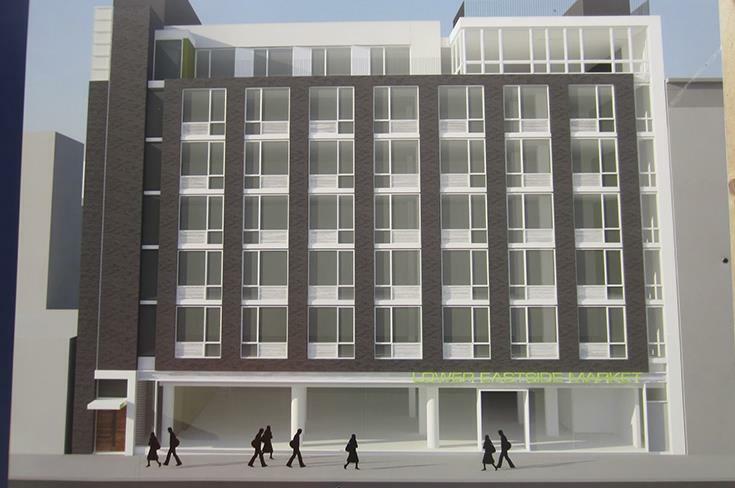 The plans show 114 residential units with 20 percent designated as affordable housing. 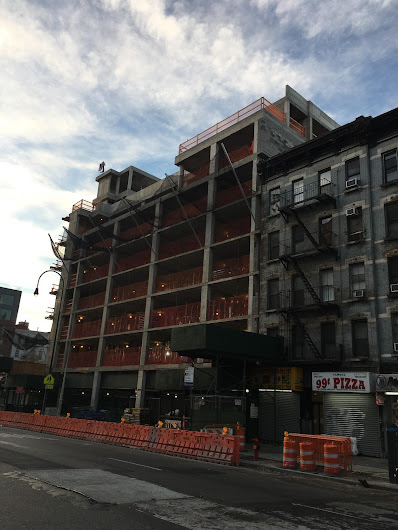 And another recap: Reps for Benenson Capital Partners and Mack Real Estate previously sought a variance to build four more floors (to 12 from 8) than the zoning would allow to make up for the "extraordinary construction costs" from poor ground conditions here. They withdrew this request in March. No word yet on when rentals may start here or if the building will have a name that pays homage to the previous tenant, the Post Office, maybe something like Next Window Please, Marked As Delivered But We Didn't Actually Deliver It or You Can Come Back Tomorrow If You Want. You can find coverage about the former Peter Stuyvesant Post Office here. It has a wonderful boxy blandness about it. Reminds me of drab overpriced big squares of the new EV. I wonder if some of the new tenants will ask TJ's for delivery? The New EV will be renamed Broville, Brotown,NYUtown or Bronyu. Vote for your favorite today! How pretty the little blue, black and white buildings right next door to it look in comparison - and they were built for poor people, unlike the architectural gruel, devoid of any personality or taste, currently being thrown up as quickly and cheaply as possible all over the neighborhood. Who will be able to afford living in these new buildings? I have heard rumors that Trader Joe's might NOT be opening a store in this space after all. Is there any way to know for sure if they are or they aren't? Hey, Anonymmous 5:55, I was under the impression that TJ's isn't opening here, but will be opening a store in Essex Crossing. Have there been new developments I wasn't aware of? Trader Joe's reportedly signed a lease from this space back in the spring. I haven't heard anything about that deal falling through... they are expected to open in the second half of 2018. 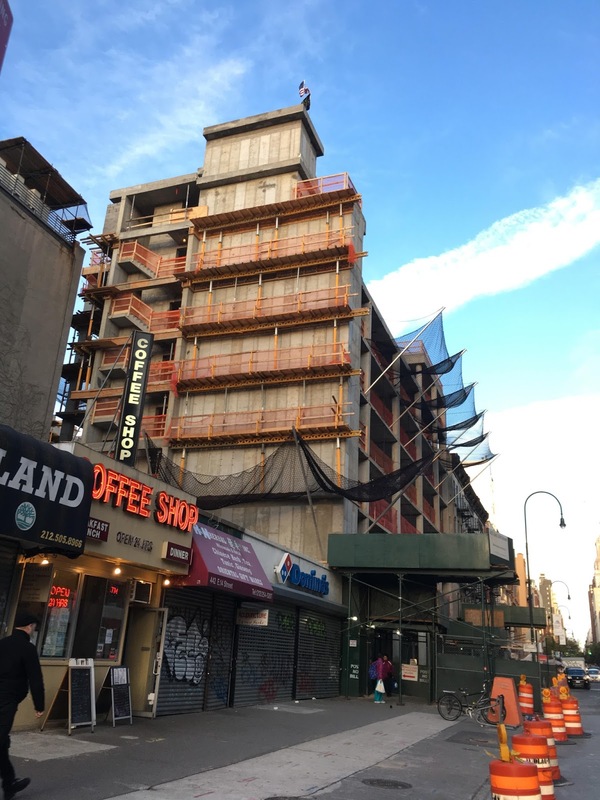 TJ's also signed a lease last fall for Essex Crossing — site 5 at 145 Clinton St. It's like I barely know you anymore, block of east 14th street between 1st and A.